MRI vendors are offering new systems designed to meet the needs of the patient, the technologist, and the administrator. That means enhanced patient comfort, increased throughput, technology that’s more user friendly, and a cost that’s more attractive to that omnipresent board of directors. How did this come about? To borrow a word from Disney: imagineering. Vendors combine engineering with imagination to humanize the MRI patient experience. “We want to soften the clinical look, feel, and sound of what has been considered the conventional MRI patient experience,” says Jacques Coumans, PhD, GE’s general manager for premium MR systems. “When a patient undergoes a diagnostic exam, they enter an unfamiliar world where they shed clothes and shed self-respect,” Coumans adds. It’s not just about depersonalization; it’s also about physical discomfort: Fifteen percent of patients who undergo an MRI exam are claustrophobic. Place them in a confined space such as an MRI tube and they experience mild to profound anxiety. Vendors now understand this, and the realization has led to the development of bigger, less confining systems. According to the company, the MR Patient Experience Suite was envisioned by GE Global Design and manifested by PDC Facilities, Inc. It incorporates lighting, interior decor, scenery, and music or sounds that the patient customizes using the iPad, transforming a cold clinical experience into a warm fireside setting. This new system does just that without compromising image quality due to its 1.5T magnet. The Optima MR430s is FDA cleared, and this alternative to whole-body systems features a manually positioned, free-floating cushioned chair with an adjustable seat and back inclination and an easily moveable ottoman. “During the procedure, a patient can read a book or a magazine,” says Coumans. Most importantly, it features 70 mT/m gradient strength at a 300 T/m/s slew rate for enhanced visualization. For technologists, the innovative design of the Optima MR430s helps improve productivity by alleviating time-consuming tasks such as positioning patients and managing their anxiety. Six isocentric dedicated radio-frequency (RF) coils accommodate a full range of patient sizes and anatomies. 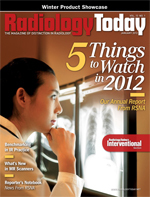 Hitachi focuses on the same patient comfort factor with its Oasis boreless MRI technology, spotlighting its innovations in November at RSNA 2011. Developed with patient comfort in mind, the Oasis system is open yet powerful enough to offer rapid exams with the highest level of diagnostic images. “This is an award-winning product in the open MRI category, as it represents the highest-strength open MRI system,” says Raymond Wtulich, Hitachi’s manager of marketing communications. At RSNA, and for the second straight year, the independent healthcare research firm KLAS named the Oasis MRI system as the leader in the open category. The system features a 1.2 vertical field magnet and Zenith RF technology. Oasis is easy for technologists to learn and use, which increases radiology department efficiency. It also boasts an array of anatomically specific receiver coils that allow for a range of advanced imaging applications. “The imaging bread and butter is there, but it also enables advanced neuro and cardiovascular imaging as well as dedicated women’s health imaging,” says Wtulich. Hitachi also showed a new Echelon Oval system, which is awaiting FDA 510(k) clearance. The system features an oval bore and a 1.5T superconducting MRI system to provide quality images with a more open feel than standard systems. At RSNA 2010, Philips introduced two work-in-progress MRI scanners—the Ingenia 1.5T and 3.0T—notes Stephen Mitchell, Philips’ senior director for MR. Since then, the equipment received FDA clearance and is available. “We began shipping in July to large and small hospitals and clinics,” Mitchell says. “We recently reached our 100th installation.” That milestone installation suggests that hospitals are accepting the technology. Mitchell describes two major benefits of the scanner. “First, signal-to-noise ratio is improved by as much as 40% compared to an analog system, which is substantial. This equates directly to improvements in image quality and speed,” he says. Second, a digital receiver system is channel independent. “Previously, MRI customers purchased systems that have a specific number of receiver channels, typically 16 or 32 channels. Conversely, the Ingenia system is independent of channels because the digitization process is accomplished on the coil,” he explains. Scalability issues are erased, “which means major cost savings related to upgrades,” Mitchell says. Upgrades to analog systems (eg, from eight to 16 channel or from 16 channel to 32) can cost as much as $250,000. Ingenia’s on-coil digitization translates into no upgrades toward a higher number of channels. Further, it is a large-aperture product, with a 70-cm bore that doesn’t compromise field of view. “It accommodates the largest patients,” says Mitchell. Philips 3T systems include the multitransmit parallel RF transmission, which addresses challenges that limit the usefulness and potential of 3T technology, such as dielectric shading effects. “It reduces artifacts, which you typically see in 3T body imaging, and it improves the image quality contrast across the field of view,” says Mitchell. Philips is also at the front end of the curve related to combined PET/MR. Recently, the company received FDA 510(k) clearance for its whole-body PET/MR system, making it commercially available in North America and Europe. (Philips and Siemens make the two systems that have 510(k) approval.) Philips’ system demonstrates less ionizing radiation compared with PET/CT and provides greater visualization, especially in the area of cardiovascular disease. Also, it is proving useful in prostate and pancreatic cancer diagnosis. At RSNA 2011, Toshiba highlighted its Vantage Titan 3T MR system, which the company designed to eliminate challenges related to whole-body imaging. The system is equipped with advanced multiphase RF transmission technology that reduces dielectric shading artifacts. Now FDA cleared, the system builds on the user-friendly features available in previous Titan systems, says Suresh Narayan, Toshiba’s senior manager for marketing development. “But the new 71-cm bore magnet design, the patient aperture opening, is the widest in the industry,” says Narayan. This enables technologists to more easily image bariatric patients and reduces anxiety related to claustrophobia. “Another patient-friendly feature is noise reduction, accomplished with our Pianissimo technology, which reduces exam noise by as much as 33 decibels,” says Narayan. He adds that the company’s technology enables noncontrast imaging techniques. “We go from head to toe without having to inject gadolinium,” he says. This includes the fresh blood imaging technique, used to image vasculature, as well as contrast-free improved angiography, time-spatial labeling inversion pulse, and time-space angiography. Siemens featured its two latest open-bore systems at RSNA 2011. At the same time, the competition came up with new RF technology. Siemens responded with its TIM (total imaging matrix) as well as workflow enhancement tools called DOT (day optimizing throughput). “The reason we made these new developments is that MRI workflow can get quite complicated, as exams take a lot of time,” says Dhamankar. Siemens’ recent developments have improved efficiency and reduced the complexity and help make MR more simple and efficient for departments and technologists. This is an important point because hiring efficient technologists is a major challenge for radiology departments. So DOT provides consistent image quality, no matter the level of a technologist’s training. “The combined DOT technology we offer guides and automates MR exams, already in areas such as the brain, cardiac, and abdomen,” says Dhamankar, adding that the DOT engine works in progress related to spine, breast, and large joints (eg, hip, shoulder, and spine). “DOT removes the complexities, and we’re increasing DOT capabilities, which will enable higher utilization, faster exams, and more consistent results,” he says. Meanwhile, Siemens is involved with hybrid technology, combining PET and MRI in its Biograph mMR system, which received FDA clearance in June 2011. According to the company, the system performs simultaneous imaging—patients don’t have to be moved to two different scanning systems—and it uses less radiation than PET and CT combined. Further, the PET/MRI combination produces greater detail when imaging many of the body’s anatomical structures. “At RSNA, we demonstrated how easy it is to use. More importantly, we have demonstrated how combined PET/MRI enhances treatment planning and, in turn, treatment processes and follow-up,” says Dhamankar.